Fee: $95 All materials will be provided. Students will take home 3 finished pieces. This workshop is perfect for beginners and for those who have experience in mixed media and are curious about the Pébéo line of products. Space is limited. 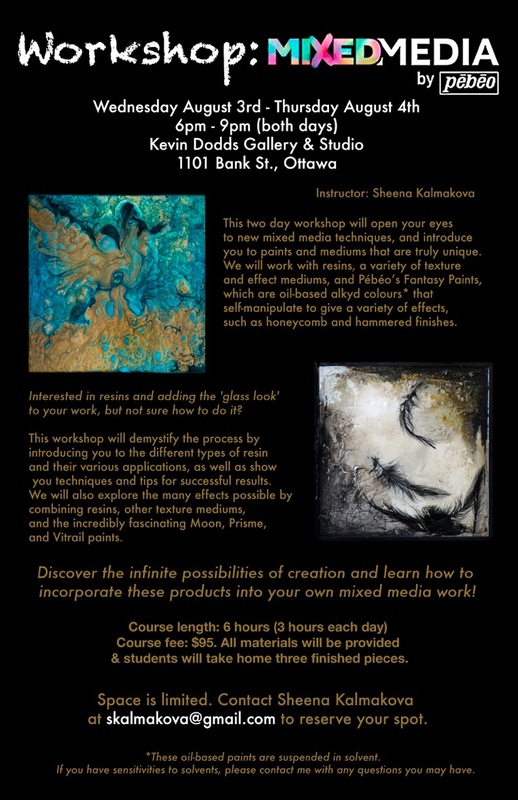 Please email Sheena at skalmakova@gmail.com to reserve your spot. can be picked-up the following day. **Students are asked to bring materials for collage, such as photos, decorative paper, and/or small objects such as feathers, beads, or trinkets. **These Pebeo oil-based paints are suspended in solvent. If you have sensitivities to solvents, please contact me with any questions you may have.